Sorry I have been a little absent of late, but I give a bit of a brief explanation here. Anyway, last night I made sausage casserole, like Anya taught me when me and Aaron went there for a pyjama party (AKA sleepover). It is the EASIEST dinner in the world, even for a can't cook, won't cook like me. The effect it had on my boys was even better than what it tasted like and that is saying something. It is simply SO easy to make. Brown the sausages (first few times I used Richmond sausages but they kept falling apart, so now this time, in the photos, I used Sainsbury's "butcher's choice" Cumberland sausages). Fry the sausages with chopped red onions (although last night in these photos I used normal onions). Add the Passata (something I had not heard of or used before Anya mentioned it). Add seasoning (I bought the "all spice" that Anya uses but I also add salt and pepper to taste). I simmered it for quite some time (like one and a half hours, but TWO if you include from when I added carrots and broccoli). So it would not go dry, I added about 400 ml of water as well as the passata. 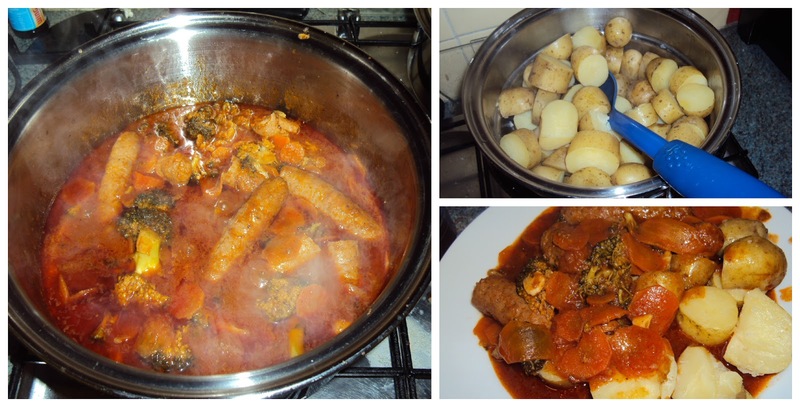 I used 16 sausages (big saucepan on the hob, so not technically a casserole). It is a great winter warmer dinner. After eating it, within 30 minutes my two boys were asleep - my son and husband. So even though Aaron has been up till circa 11 p.m. of late, I had him and his Dad asleep in the sitting room (Dad at 20:30 and Aaron at about 20:50) and by 21:30 had moved them both to the bedroom. I stayed up will midnight so had an unexpected pleasant evening to myself. THAT mental headspace, then gave me the oooomf and the clarity to do a whole load of decluttering today (although I did a load yesterday too). It is a cheap Ikea 2 shelf thing that I think I have owned for about 20 years. I think I originally paid £7 for it. Anyway it had been in the corner of our bedroom with a bedside lamp and a telephone on it, but today I had the idea (thanks to the inspiration) to move it to the sitting room so that Aaron's books could go on the top shelf and his DVDs on the bottom shelf. If you stare hard enough you can see the DVDs at the back, with his wooden sets in front (as the shelf is so deep). It was obviously meant to be, as his DVD collection EXACTLY fitted the width of the shelves (if you can call this yoke shelves) ha ha! Anyway girls, thank you for the inspiration, all three of you. Last time you commented it was via Twitter. My jar of all spice is nearly done so I will move on to the official ingredient. I might miss my funny version though. Got used to the taste now. Also it is good to add veg in for the last half hour. Broccoli works really well. Can't remember if I mentioned that above. thanks for the link and the recipe. I'll try this out next week I think. I only have pasta sauce in at the moment and not passata. I agree with Anya though - this is one of those recipes that you make "your own" by adding in stuff to suit your family's taste.